Primed to become one of the nation’s most lucrative medical marijuana markets once it’s up and running, Florida’s program will license just a handful of businesses to produce, process and distribute all MMJ sold in the state. It’s a situation that may give rise to some of the nation’s largest marijuana firms. During a special legislative session this month, Florida lawmakers were finally able to reach an agreement on rules governing the state’s MMJ program – previously thwarted by disputes between the House and Senate about the number of dispensaries each license holder should be allowed to operate. On top of the seven licensed businesses currently operating under Florida’s CBD-focused program, the new bill will license 10 additional vertically integrated MMJ businesses by October 2017, with each allowed to open 25 dispensaries. Florida Gov. Rick Scott said he “absolutely” intends to sign the medical marijuana bill. That will bring to 17 the total number of companies authorized to produce and dispense full-strength medical cannabis across the state. And the maximum number of dispensaries will increase to 425. The ratio of dispensaries in Florida to the businesses that own them could therefore reach as high as 25:1, far surpassing any other marijuana market in the nation – recreational or medical. This may lead to Florida becoming home to some of the largest chains of marijuana retailers in the United States. While not a one-to-one comparison, Nevada’s medical marijuana industry currently has 55 dispensaries operated by 39 separate companies – a much more diffuse market that has yet to produce any dominant retail chains. Though Florida’s law has provisions that allow the addition of licenses as the program grows, it won’t change the fact the Sunshine State has adopted regulations that effectively create an oligopoly – where the market is dominated by a small number of players. While oligopolies are in place in many other states with MMJ programs – such as New Jersey and Maine – the sheer size of Florida’s market creates an unprecedented opportunity for businesses that manage to secure a license. According to Marijuana Business Daily estimates, Florida’s potential patient pool could total 100,000-300,000 and annual sales through dispensaries could reach $600 million-$800 million in the next three to five years. For context, total sales of retail marijuana in Washington state in 2016 were roughly $700 million, spread across hundreds of licensed businesses. 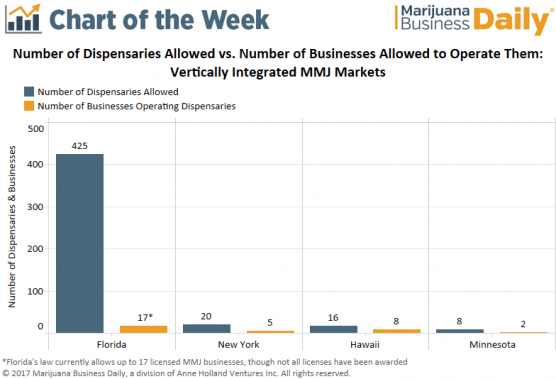 And although Florida’s market is structured similarly to states such as New York or Hawaii – where a limited number of companies are tapped to open a finite number of dispensaries – the high license cap in Florida will allow each licensed business to operate much more freely. For example, New York allows each of its five licensed businesses to open four dispensaries across the state. So while a company may identify 10 locations in which a dispensary could be opened and run profitably, they’re forced to choose just four. In Florida, such limitations will be almost nonexistent. And by 2020, Florida’s cap on the number of dispensaries each business can operate will be lifted, though the number of licensed businesses will remain unchanged. Should favorable market conditions persist, this will unleash the most successful players and allow them to grow even larger – unconcerned by the threat of any potential new competition. Though questionably legal, many companies previously licensed under Florida’s CBD program have already begun selling full-strength medical marijuana, giving them a significant first-mover advantage. 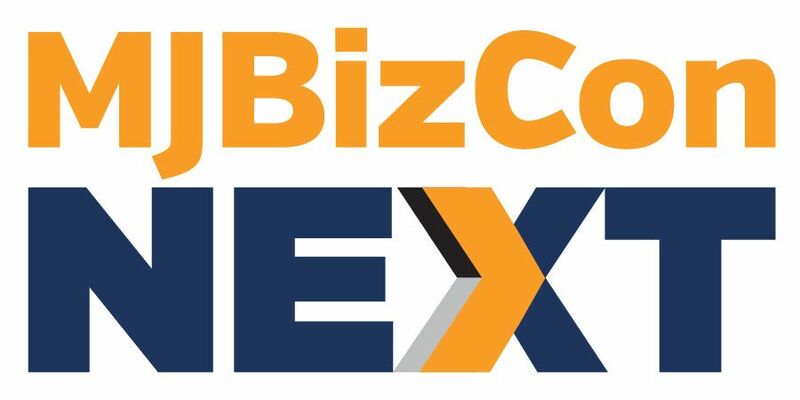 These businesses could run up against the dispensary cap of 25 well before the newly licensed companies, and by the time the cap is lifted in 2020, they’ll be in a much better position to leverage their operational expertise and economies of scale to push out smaller competitors. Florida’s MMJ program is still in its infancy, and subsequent legislation could change the market dynamics significantly. But right now, it’s a great time to be a license holder in Florida. The rich get richer and the poor get poorer. Old boy network is alive and well. Especially Florida. First insiders bought up all the established Greenhouse operations of one size and type then passed laws that only those greenhouses could produce the states crop. This of course will make obscene fortunes for a few fat cat politicians and totally cut out any small scale operations. Floridians should not stand for it. I wanted to go to Flordia to start a small greenhouse operation. The only way into Flordia was a couple crooks who wanted me to fork over 8 million dollars to buy into a government sanctioned grow. I looked at the operation and the whole thing was not worth 8 million. I could have bought the land and equipment for less then 1 million. These guys were making millions and had not even put a shovel in dirt yet. The whole thing makes me sick! It was better when the Mexicans and the Colombians ran the MJ trade. At least you knew who the bad guys were. I look forward to any progress FL makes For the People. Myself, I invest in the labs. I figure that regardless of who grew it or who’s selling it that ALL of it will need to be tested. Florida has always had the best legislature that money can buy. Only Louisiana or Chicago comes close to the corruption. Morgan and Morgan were you part of this?